Sister Ann Mathieu is a woman of many interests and talents. She has been a member of the Hospital Sisters of St. Francis since August 1957. Her journey during those years has taken some interesting twists and turns. Sister Ann grew up in Chicago and learned about the Hospital Sisters from her best friend’s older sister. This young lady was a student in the Aspirant School at the Motherhouse. Ann and her best friend’s family came to the Motherhouse to visit on several occasions. As a young teenager, Ann was touched by this experience, and it led her to join the Hospital Sisters of St. Francis after completion of her high school education. Recently, Sister Ann found her diary from her freshman year in high school. In it she made one very significant entry. After a visit to the Motherhouse, she wrote "I would love to stay there forever." What an insightful and profound note! Sister Ann’s first career was in dietetics. She graduated from Fontbonne College in St. Louis, Missouri in 1964 and practiced as a dietitian for several years at St. Mary’s Hospital in Streator, Illinois. Soon however, Sister Ann was back to school earning a Nursing Degree from Marillac College in St. Louis, Missouri. She plied her trade as a nurse in the Intermediate Care Unit at St. John’s Hospital and at St. Monica’s Home, a home for pregnant teenagers, which are both located in Springfield, Illinois. At St. Monica’s Home, Sister not only cared for the pregnant teenagers but lived in the same facility with them. Several years and experiences later, Sister again used her nursing education while working with chemically-addicted individuals at the L.E. Phillips Center in Chippewa Falls, Wisconsin. Soon, Sister Ann assumed administrative responsibilities. From 1975-1982, she was the Administrator of the Franciscan Apostolic Center that was located on the Motherhouse grounds in Springfield. In 1982, Sister Ann was elected to the Provincial Council and served the Community in that role for three years. During this time, she was also the Administrator of the Motherhouse Complex. As a true Franciscan, Sister Ann has been drawn to working directly with the poor and disenfranchised. She had a brief stint working in Peoria, Illinois as a missionary to the poor. In 1998, she served as a staff member with the Haitian Health Foundation in Jeremie, Haiti for six months. Her present ministry is as a massage therapist. Sister studied at the Chicago School of Massage Therapy. She has also developed an interest in Reiki and energy work and pursued additional education in this area. 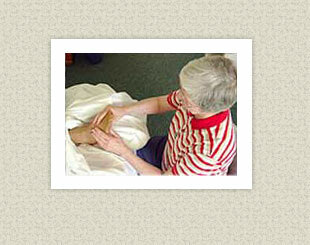 Presently, she is a National Certified Massage Therapist and a Certified Healing Touch Practitioner. Sister Ann describes her work as a massage therapist as "a call within a call," which is how Mother Theresa described her own vocation. It provides Sister Ann with the opportunity to have one-on-one contact with many individuals. These people come to her for an experience in relaxation, stress reduction, pain relief, personal growth and healing. She has a small suite located at the Motherhouse for her clients. They often comment that coming to the quiet, prayerful atmosphere brings them a sense of peace. This is the turning, twisting road over which Sister Ann has traveled during her 46 years as a Hospital Sister of St. Francis. She feels blessed to have been able to minister to so many different people and to have pursued such fulfilling professional opportunities in service to her Religious Community and to the broader Church.